Salvacion Zamora-Rodriguez is a low profile person, but she is a by-word among the people of Dos Hermanos, Talisay, Negros Occidental, PH and Barangay 2, La Carlota City respectively as efficient Barangay Health Worker (BHW). Her name, Salvacion is a Spanish in origin. It is equivalent to English word, salvation. No wonder why, she has "saved" some people who are suffering from serious diseases. Thus, in the very nature of her work as barangay technician for health on primary health care, she had “saved” two poor sick people in her area of assignment. These persons were native of La Carlota City. It happened that one of them is my nephew. One of the children of uncle George Iligan. He is Dikiam Iligan. Now he fully recovers and is earning for a living a skilled carpenter. The other one is Mary Ann Gonzales who is also suffering from a malignant disease. Both of them were saved from possible death by Sally who administers for their daily medical needs and assistance. If not for Sally's consistent health service in monitoring and dispensing prescribed medicines for them, probably they might have had passed away. Sally as her friends fondly called her is a jolly fellow. By looking at her, you might mistake her as arrogant and ill-tempered person. But she is not once, you’re acquainted with her, You could say that she’s amiable, friendly, happy and easy to get along with. Sally values service above self. She has been in working as health worker for 25 years, 8 years in Talisay and presently she is still working in La Carlota City. She works persistently from day in to day out and even doing “extra miles” for clinical and medical assistance without any monetary consideration. She’s not only an effective health worker, but also a good cook. Service for her counts most. I used to buy some native delicacies from her. Sally never complains the risky nature of her work. 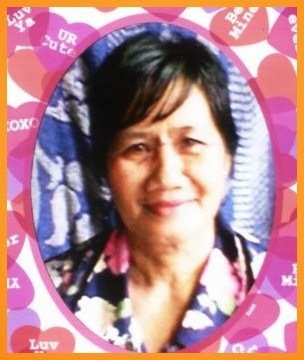 Though receiving a meager remuneration from the government, she’s just happy and contented because of the unfailing moral support from her 8 grown-up children, 17 lovely grandsons and granddaughters, and his ever-loving hubby, Enecirio Rodriguez who is already dead. Every August 22, Sally is celebrating her birthday as being as grateful as she is in her natal day she thanks the Lord the Almighty for giving her another life. This means another big opportunity for her to continue and even better improve her present job as humble, efficient health worker, and her role as a parent, grandmother, and a caring, loving wife to her kids, grandsons and granddaughters, and husband. She wants to express thanks to Mrs. Precy Treyes of Dos Hermanos, Talisay, and Mrs. Eufrecena “Diding” Montales of La Carlota City and her co-workers and friends for their warm friendship and camaraderie. She is also thanking them for their comfort when she’s down and despondent, and their sympathy when she’s in high spirits and satisfied. My wife, Rebing and I would like to express our humble prayer that Sally will be blessed with better health, the strength and the courage of the Lord to overcome any form of afflictions, trials and challenges that may come along the way as she dutifully does her exemplary humanitarian job for the welfare of those in need. Sally is worthy to be emulated. More power to you, Sally. By the way, Sally is one of the sponsors of the marriage of our eldest son, Dondon, who is now residing somewhere in Mindanao! She really helped lots of people for her job and blessed it continuously by God. More blessings will come to her and people too, will extend for their love to this woman. There was this joke on my previous work where "nice-looking people are not actually nice, snob people are actually the good", just an implication not to judge the book by its cover hehe. Miss Sally is sure to be a great example for this for she has helped a lot of people. It's a rarity nowadays to come across people like Sally. They should be appreciated, honored and recognized as much as they deserve. She is definitely a very admirable and dedicated woman in the service of her countrymen. God bless her. It is great to know that there's still good people like her in our country. She's indeed an amazing woman. May God bless her more. Kudos to Ms. Sally. Thank you for recognizing her service and introducing a inspirational real person to all of us. Sally really does a lot of good deeds. She deserves to be honored and people should follow her. It's good to know that we still have good souls like her around. Gives you a bit more hope that such nice people do exist now. Ms. Sally did a very excellent job in helping people. Respect her much! Good to hear that Ms Sally got the recognition for her work and as a person too. I feel that little respect and admiration can do wonders. I am glad your nephew was helped by Sally. There should be more recognition for healt workers like her. Truly admiring to hear stories of inspirational people who help out without expecting much in return. God bless you, Sally! Thanks for giving Sally a very great honour with the credit over here! I believe it's the thought that counts, and being grateful makes everything better and easier! what an inspiring personality. Thanks for the wonderful article and letting us know about sally and her work.